Katrina Caldwell, Ph.D., began serving as the University of Mississippi's first vice chancellor for diversity and community engagement on Jan. 1, 2017. 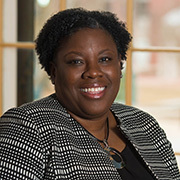 In her role as vice chancellor, Caldwell's responsibilities include leadership and coordination of UM's efforts to create and supervise a diverse, inclusive and welcoming environment for all members of the community. She is organizing and integrating an infrastructure that will facilitate and encourage community engagement, developing partnerships to effectively facilitate transformation, and identifying and supporting target areas to maximize the university's impact. Formerly the assistant vice president for diversity and equity at Northern Illinois University, the Memphis, Tennessee, native has a track record of successful strategic planning and implementation of diversity programs at Chicago-area higher education institutions since the mid-1990s. Caldwell holds a Ph.D. and master's degree from the University of Illinois at Chicago and a bachelor's degree from Spelman College. She was also a Diversifying Faculty in Illinois fellow. Prior to accepting the NIU post, she served eight years at DePaul University. Caldwell was hired there as director of adult student affairs in 2004, and by 2008 she was creating cultural programs that celebrate the values of the diverse communities at the university as director for the Center for Intercultural Programs, serving on the President's Diversity Council responsible for DePaul's university-wide diversity strategic plan. At the University of Illinois at Chicago, Caldwell served as assistant dean of minority affairs from 1998 to 2004, developing and successfully implementing a strategic plan to increase outreach to prospective students, retention/graduation of graduate fellowship students, and professional development programs. Prior to 1998, Caldwell served as director of the Higher Education Basics Program, Student Assessment and Outcomes at East-West University and associate director of the Summer Research Opportunities Program at UIC. Caldwell's honors include the White House's Presidential Award for Excellence in Science, Mathematics and Engineering Mentoring, Illinois College Personnel Association Award for "Outstanding Contribution to Social Justice" and Who's Who in Black Chicago. In 2011, she was recognized as a recipient of Diversity MBA magazine's Top 100 Under 50 Executive and Emerging Leaders award as a result of her leadership and vision in the field.